LEADER, teacher, village ambulance driver – Christian Brother Frank Hennessy has laboured for the best in people from Ballarat to East Timor. Br Hennessy was recently in Brisbane for the final thanksgiving at St Joseph’s Gregory Terrace as the Christian Brothers withdrew from East Timor. He worked in East Timor for five years as ministry leader where he changed the lives of thousands of Timorese. In that role, Br Hennessy drew on a lifetime of experience. Born in 1944 to two deaf parents, Br Hennessy grew up in a deaf community. Religious life was in the Hennessy family’s bones as his brother, Kevin, went on to become a Passionist priest. Both brothers, and their two sisters, grew up in the heart of AFL country. “And if you know anything about the Geelong Football Club, you’ll know where I’m from,” Br Hennessy said. He was without a doubt, Br Damien Price said, the club’s biggest supporter. Aside from football, Br Hennessy had a passion for teaching. After his own schooling in Geelong and Bundoora, and picking up some life skills in the Boy Scouts, Br Hennessy joined the Christian Brothers. “In the excitement of my youth, I thought this was the best thing I could do with my life and I still think that,” Br Hennessy said. After decades of teaching in mostly secondary and technical schools, Br Hennessy was sent to St Vincent’s Boys Home in South Melbourne in 1991. “That’s where I’d say was the beginning of my education,” he said. “It was the first time that I had met with dysfunctional families, where the kids were dysfunctional and the parents were dysfunctional. “It’s almost an inheritance in those families. After seven years of caring for those children, MacKillop Family Services – a combination group of Josephite Sisters, Mercy Sisters and Christian Brothers – took over the home. 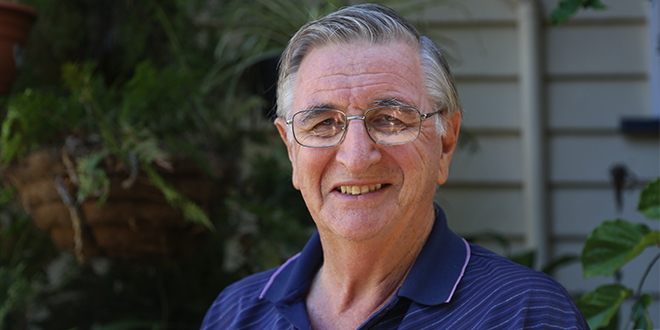 “(MacKillop Family Services) was the best thing to really happen in welfare,” Br Hennessy said. Br Hennessy was in leadership in Victoria for six years and spent four months in East Africa teaching English to prospective young men wanting to join the Brothers. It was after this that he was tasked to go to East Timor. He led and supported a number of works in East Timor, including an ambulance service, a preschool system and the introduction of vanilla crops for economic boosts to farmers. But nothing comes easy in a place as poor as East Timor. “You never get to understand the people completely,” Br Hennessy said. “There’s a cultural barrier between people that, in a way, can’t be crossed. This meant Br Hennessy was always reliant on interpreters. He said this prevented him from understanding the underlying “spirituality or the emotion” beneath the words. In those cases, Br Hennessy said all you could do was be present for them. “But there was still that void, if I can use that word void, between the cultures,” he said. Faith was one way to bridge that void, Br Hennessy said, but even faith had its cultural gaps. “The faith in Timor is a very devotional faith and attachment to God and Jesus that marries into their traditional beliefs,” he said. “Animism was their spirituality, it was around the sun god and the trees and nature. “When the Portuguese came five hundred years ago, they brought the Catholic faith to Timor. Br Hennessy said faith in the western, Australian sense was also about social justice and “not lighting candles”. Devotional faith had its problems. Br Hennessy lamented the Timorese people’s decision to repeatedly build churches rather than classrooms. He also lamented the unchanging, tragic conditions in the villages. “This lady, she had the baby, and she died and the baby died – they both died,” Br Hennessy said. “You don’t have undertakers, you don’t have priests saying Mass for the family. “It was in the village in which we were living and so I go along. “You’re just in the room and the two bodies are laid out on the table. “People are sitting around either in private prayer, saying the Rosary, or they’re wailing. “People outside are supporting what’s happening but some of them will be playing cards, betting on the cards, others will be talking, kids will be playing soccer. Infant mortality in the first six months of life was about 1:45 babies in the villages, Br Hennessy said. “In Australia, they want to know why,” he said. In Timor, he said, when a baby died no doctor comes; nobody checks why the baby died. He said often people would just say, “Oh it was coughing last night and dead this morning”. “That’s a heart-wrenching decision to be part of that,” Br Hennessy said. Even with the hardships and the setbacks, Br Hennessy’s work in East Timor had its quirks too. At 4am, Br Hennessy was awoken by a knock on the door. The people who lived next door asked him to drive a woman, who was in labour, to the clinic. “We raced down to the clinic,” Br Hennessy said. “The baby was born about an hour-and-a-half of us arriving at the clinic. “The midwife said, after only two hours, she’s ready to go home now. One of the big innovations he was involved in was the introduction of vanilla crops for the farmers. Br Hennessy said a worldwide shortage for vanilla meant Timorese farmers received $57/kg, whereas coffee, which was what the Timorese farmers usually grew, was sold for 32 cents/kg. On world markets vanilla is valued at more than $500/kg. Unfortunately vanilla only produces a crop every four years, so it couldn’t become the farmer’s main crop. The program helped the farmers produce a four-year crop of vanilla and continued their annual coffee crop – netting the farmers an extra $1000 every four years. Br Hennessy said after seeing the program succeed, farmers from all around wanted to be part of the vanilla program. “It was a great four-year bonus for the farmers,” he said.